There aren't really any serious changes to it as such, just some minor things. Again, note, that there are a few changes to some of the existing "high profile" AOT elements, so please read through the description of changes in the above post. The time of the annual Microsoft Dynamics Salary survey is again upon us. 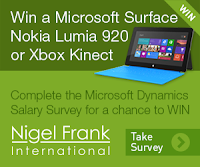 Nigel Frank International would like to invite you to complete our annual Microsoft Dynamics Salary Survey. Take the survey and you will automatically be entered into our prize draw to win a Microsoft Surface Pro (128 GB), the Nokia Lumia 920 or Xbox 360 Kinect Bundle. You will also receive a FREE copy of the Salary Survey report once it has been compiled. The industry acclaimed annual “Microsoft Dynamics Salary Survey” is the world’s most comprehensive insight into global salary trends for Dynamics professionals. Use the survey to benchmark your team's, company's or your own salary.